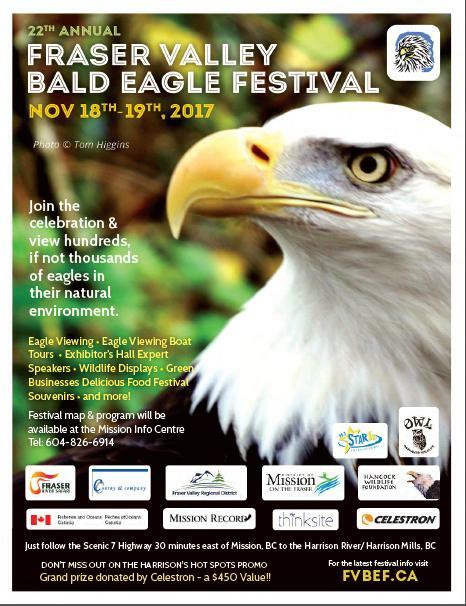 Time to start thinking about attending the 22nd annual Fraser Valley Bald Eagle Festival if you haven't already. The Fraser Valley Bald Eagle Festival is now in search of the 2016 THEME PHOTO. The selected photo will be featured on the cover of our printed program, used throughout our marketing material and will be made into our souvenir button for the year. The photographer will also be highlighted on our website with a short bio as we honor their contribution to the event. We will also feature the runner up and create a sticker to be given away during the festival weekend. What is better than a great photo of an eagle in our beautiful Fraser Valley? Please send your photos in by May 31 and if you are not the photo-taking-kind, share with someone who is. We love seeing all the pictures that are submitted. The winning photo is selected by the committee at our July meeting. Thanks to JOY TV for sending us the segment that will be aired on their program called Fraser Focus. Two weeks ago David Hancock, Jean/mjb and I went out to Harrison Mills, BC to meet with JOY TV for the promos that they shot for the upcoming Fraser Valley Bald Eagle Festival on Nov. 21 and 22. Here's the first promo that the producer sent me. It will start running on JOY TV (Vancouver's Channel 10 on Shaw Cable) this weekend. Harrison Mills is the bald eagle capital of the world and there are already hundreds of eagles out there. Please come join us at the Festival. Here's the video. In addition to David you will see Betty Anne Faulkner of Pretty Estates along with Karen Wheatley and Rob Hope from OWL (Orphaned Wildlife) with their education eagle, Sonsie.